The first time I watched Shutter Island, I sat transfixed as the end credits rolled, slowly absorbing what I had just seen and feeling an infinite wave of sadness. This is one of the few films I can think about that have had such an effect on me as a result of the last five minutes of images followed by the music from the credits. For, rest assured, a movie is not over until the last music note is heard and the lights go up – as any true film fanatic knows, both the beginning and end credit sequences are an integral part of the experience, establishing or recapitulating mood and subtext. And as usual in the work of director Martin Scorsese, the ending to Shutter Island is a great example of this. But first, let’s talk a little about love and madness. Shutter Island, based on the novel by Denis Lehane, starts with the ominous sight of a boat emerging out of heavy fog. Aboard are two U.S. Marshalls, Teddy Daniels (Leonardo DiCaprio) and Chuck Aule (Mark Ruffalo). The year is 1954 and the two policemen are approaching a small island in Boston Harbor. They have been tasked with investigating the disappearance of a patient at the hospital for the criminally insane which resides on the premises. But the guards and doctors at the institution are on edge. The staff appears to be hiding something. Even the lead psychiatrist, Dr. John Cawley (Ben Kingsley), seems strangely unhelpful. Little by little, Teddy starts to suspect that sinister things are happening, and that Solando’s disappearance may be a clue to the hospital’s real purpose: Mind control experiments with psychoactive drugs, perpetrated on the patients themselves. Leonardo DiCaprio as U.S. Marshall Teddy Daniels. Teddy starts to have flashbacks to his days as a soldier in WWII, where he participated in the massacre of German concentration camp guards at Dachau. He has vivid visions of his dead wife Dolores (Michelle Williams), who he lost to a mysterious fire, and of a strange little girl. He gets more and more paranoid. His migraines escalate. Is he being drugged somehow? As the pieces of the conspiracy seemingly mount, Chuck suddenly vanishes. Teddy is convinced his partner has been taken to the enigmatic lighthouse on the island, where he presumes lobotomies are taking place. He makes his way to the top… only to find Dr. Cawley there. And then the truth comes out: Teddy’s real name is Andrew and he is one of the patients at the hospital, a man who suffers from delusions and a complex split personality. His blinding love for Dolores made him ignore the signs of her mounting manic depression, which eventually led her to kill their three children. Andrew in turn went mad, killed his wife, and slowly built the character of Teddy as a way to cope with the trauma. Yep, the movie we’ve just seen is actually just an elaborate ruse, created by the psychiatrist and staff in an effort to hopefully cure the troubled young man. Teddy has a vision of his deceased love Dolores (Michelle Williams). 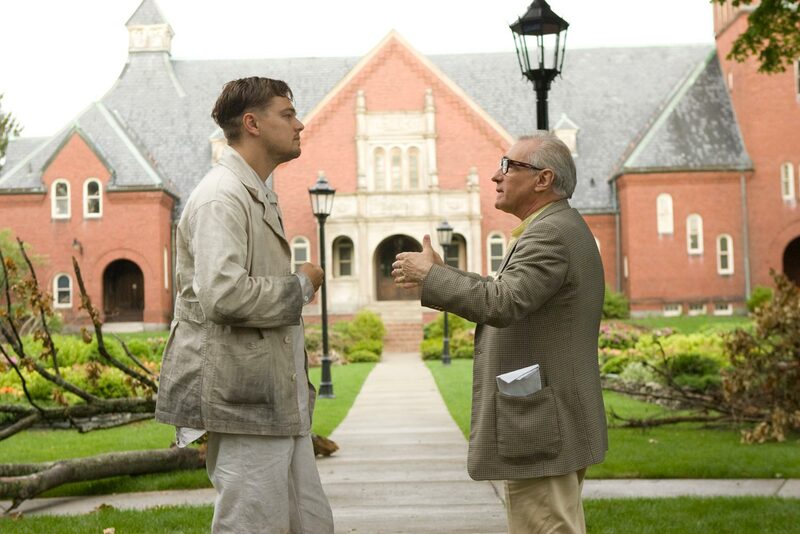 Sometimes twist endings collapse under the weight of their own convoluted answers, but Shutter Island‘s gotcha moment works because, in a way, Scorsese never conceals the fact that Teddy is unhinged: Throughout the film he hallucinates, needs meds, and is prone to violent episodes. The stylized mise-en-scène is similar to Scorsese’s earlier thriller Cape Fear (1991), with high-contrast photography and a great selection of previously recorded music that perfectly fits Daniels’ varying states of mind: As he approaches the mental facility for the first time, Krzysztof Penderecki’s relentless Symphony No. 3: Passacaglia plays in the background, signaling unease and danger; Max Richter’s On the Nature of Daylight beautifully underscores Teddy’s passion for Dolores; Gustav Mahler’s Piano Quartet in A Minor triggers horrible recollections of war. Much has been written about Scorsese’s innate grasp of music as a vehicle for thematic concerns, and here he relies on collaborator Robbie Robertson to mix and match compositions that subconsciously signal to the audience that we’re in the company of a fractured character. Leonardo DiCaprio and director Martin Scorsese. Shutter Island is the type of film that really comes alive on repeated viewings. In essence, everyone in the film is “acting” for Teddy’s benefit, and this becomes more and more obvious the more you examine and dissect each scene. Those twitchy guards at the beginning? They are not nervous because of the “missing” patient. No, they are nervous because Teddy is a dangerous patient… and now he’s unshackled, delusionally playing a cop. As Teddy investigates, both Dr. Cawley and Chuck (who’s actually Teddy’s physician, Dr. Lester Sheehan) give him pills for his headaches, but what they’re really doing is keeping him calm. In the background, the staff is sometimes seen laughing; Teddy interprets it as strange behavior – maybe they’re hiding evidence? – but in reality they’re laughing at him. Clues and situations must build for Teddy to ultimately reach the lighthouse and face his fears, including having Chuck disappear, and in Ruffalo’s nuanced performance you can see the compassion his Dr. Sheehan feels for his patient/partner. Scorsese is making two movies at the same time here: The one Teddy and the audience think they’re watching, and the one that is real. It’s a high-wire act. For me, the best moment in Shutter Island comes when Teddy finds the escaped patient, Rachel Solando (Patricia Clarkson), hiding in a cave. She tells him she’s not a patient, but one of the doctors at the institution – she’s found out about the secret experiments and must now figure out a way to get off the island without getting caught. Solando implores Daniels to be careful, to trust no one. Dr. Cawley and his cohorts will attempt to commit Daniels to the institution, same as they did with her, and prevent him from blowing the lid off the conspiracy. If they offer him drugs or cigarettes, he must refuse – they will surely be laced. It convinces Teddy. And as I was watching the film, it also convinced me that that was exactly what was going on. Thing is, Rachel Solando doesn’t exist – she’s merely a figment of Teddy’s imagination. Teddy, in essence, has a conversation with himself in which his psyche convinces him, and by extension us, that he’s not crazy… when in fact he totally is. Shutter Island is not for everyone: Some of the amplified touches – flashing lights, abstract dream sequences, bloody outbursts of violence – go a bit overboard, and the extreme therapy Dr. Cawley comes up with in order to heal Teddy is too elaborate to believe. Yet there is no denying Scorsese’s love for cinema as he constructs this gothic haunted house of the mind. So let me go back to that ending. In the film’s final minutes Teddy, apparently still insane, quietly tells Dr. Sheehan, “Which would be worse, to live as a monster or to die as a good man?” And the audience grasps that the treatment has actually worked. Teddy is sane again. But he would rather go through a lobotomy rather than live the rest of his days with the guilt of having indirectly killed his children and shot his wife. The last shot is of the lighthouse, standing rigid among the breaking waves, sentinel to and symbol of Teddy’s madness. Then the credits begin and Scorsese and Robertson treat us to what is, for me, the single most amazing mashup of music I have ever heard: Max Richter’s On the Nature of Daylight (2004) and Dinah Washington’s This Bitter Earth (1960). Both were great musical pieces on their own, but together the effect is transformative in a way that I can’t fully express. As Washington sings “What good am I? / Heaven only knows / Oh, this bitter earth / Can be so cold” over Richter’s lamenting strings, the whole movie comes into truly evocative context: A melancholic reminder of the pain of regret, it’s a sad and haunting coda that elevates Shutter Island from a good film into a truly memorable one. Scorsese may be a born cinema stylist… but it’s his fascination for the human condition what stays with you long after the last credit rolls.